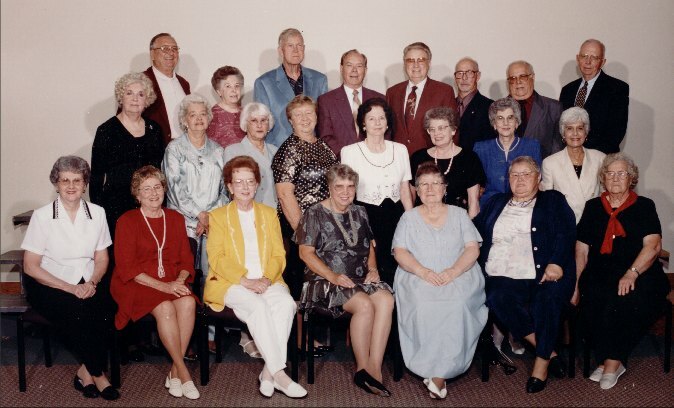 June 16 - 18, 2000, for their 50 year class reunion. A picnic serving as the get-reacquainted function was held on Friday. Saturday morning and afternoon were spent reminiscing, visiting and shopping; and some of the classmates visited one of their former teachers, Miss Elizabeth Kailing, at her home in Princeton. Class photo settings and the reunion dinner-dance was held Saturday night. On Sunday there was a breakfast followed by a service of worship conducted by various lay and ordained classmates in attendance. Front L-R: Lois Black Godfrey, Evelyn Crabtree Elkins, Betty Tibbs Hagenrater, Kathlyn Beverly Richardson, Mable Triplett Huli, Pauline Walters McGimsey, Verla Arnold Felts; Second Row: Peggy Sells, Reba Compton Bolt, Joyce Romans Cunningham, Janie Walters Caldwell, Lena Belfiore Buccarelli, Norma Linkous Paley, Nancy Majestro Rasi, Lucille Pascone Rincich; Third Row: Whitley "Bobo" Henderson, Florence Hendricks, Bobby Pearman, Paul Day, Curtis Kemp, Charles McDonald, Eddie Pascone, & Edward "Sonny" Burton. Absent from picture : Joan Romans O'Neil. 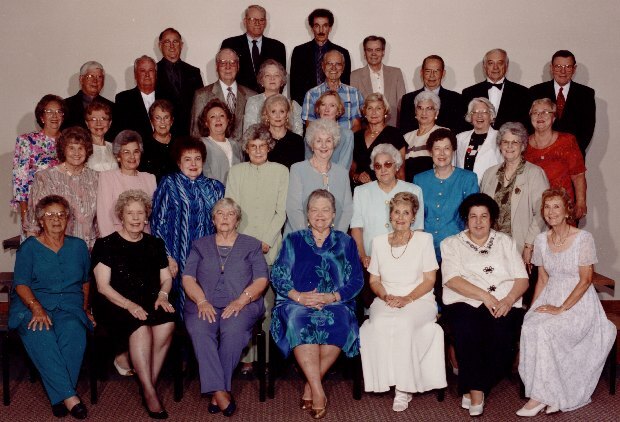 Front L-R: Hallie Boyd Siebel, Jerry McGee Worley, Jacqueline Swim Strattis, Betty Young Fanning, Bonnie Belcher Gattuso, Mary Patrinicola Porter, Iris Allen Panzetta; Second Row: Cindy Meade, Josephine Majestro Chiari, Carole Arnold, Louise Mills Justice, Dorothy Mitchell Bignotti, Mary Verduce Gianato, Alice Chapman Rubash, Wanda Shook Harmon; Third Row: Glenna Christian Pack, Charlene Warren Hinnant, Patricia Jones, Josephien Ricci O'Neall, Dorothy West Hodges, Virginia Goodson Arentzen, Betty Johnson Dandelet, Mary Chiericozzi Setzer, Carol Price Clark, Joan Whyte Blackburn; Fourth Row: Jimmy Hampton, Bobby Sigmon, Donn Branch, Peggy Rolen Hatfield, James Perdue, Ronald Roberts, Dan Zaccagnini, Don Stacks; Fifth Row: Masol Bowman, James Rich, Howard Hull, & John Banks. 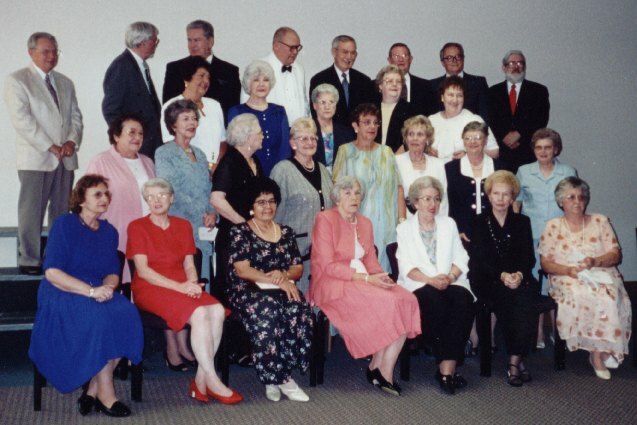 Front L-R: Bonnie McDonald White, Billy Linkous Perry, Helen Quesada Day, Peggy Mabry Bowman, Eula Bradley Behr, Florene Cline Walker, Opal Kitchen Parobek; Second Row: Minnie Spencer Robinson, Nancy Sells Wagner, Carol Christy Branch, Barbara Shaw Reed, Louella Hunt Nester, Gaye Murphy Hamden, Mary Cisco Korezyk, Lucille Kemp Huff; Third Row: Lousie Farris Kaline, Ida May Farris Currin, Marietta Clagg Young, Nancy Dalton Akers, Ella Arnold Bauer; Fourth Row: Jim Rush, Robert Bratton, Deano Farris, Don Hawthorne, Tom Branch, Bob Smith, Richard Tabor & Carl Greever. Donnie Skuja by email or call me at 410-549-7190 or send me mail at 741 West Watersville Road, Mount Airy, MD 21771. Click Here to see some snapshots taken at the reunion.